Every year around the Fourth of July, LA Animal Services shelters fill beyond capacity with terrified lost pets. This means that available shelter space can be the difference between life and death for our shelter guests who have been with us past the required hold period. YOU can make that life-saving difference by fostering for four days or more or adopting. The loud sounds of July 4th fireworks frighten dogs and cats. If they get out of the house or yard, they run in fear. Then these frightened dogs and cats can’t find their way home and end up at our City shelters. Over the last three years, the shelters took in over 1,000 animals each year between July 2 and July 6. These pets are counting on us to help reunite them with their families. We need YOUR help right now to create life-saving space in our crowded City shelters. We have hundreds of wonderful dogs and cats of all ages, breeds and sizes waiting to be your temporary companion or best friend forever. Adopt or foster a shelter pet today. By giving a shelter pet a new home or letting them stay with you for a short time, you are saving two lives, the one you are caring for and the one who now has room at the shelter. 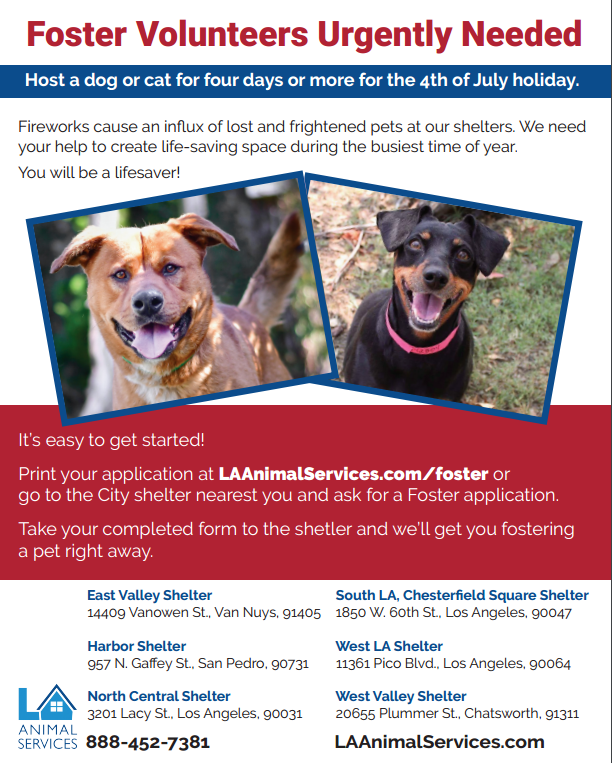 To volunteer to foster, print your application at LAAnimalServices.com/foster or go to the City animal shelter nearest you and ask for a Foster Volunteer application. Take your completed form to the shelter and we’ll get you fostering a pet right away. The shelters are open Tuesday through Saturday from 8 a.m. to 5 p.m. and Sunday 11 a.m. to 5 p.m. We are closed on Mondays and the Fourth of July. To find the shelter closest to you, visit LAAnimalServices.com/shelters or call (888) 452-7381. 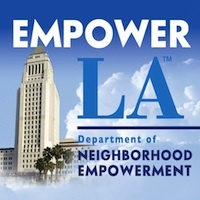 With your help, we can save more lives in the City of Angels! Our heartfelt thanks will be nothing compared to the lifetime of memories and unconditional love you will get from your furry friend.